RIYADH, Saudi Arabia (AP) — Yemen’s Houthi rebels attacked a Saudi oil tanker in the Red Sea on Tuesday, causing “minor damage” to the ship, the Saudi-led coalition battling the rebels said. Coalition spokesman Col. Turki al-Malki said the attack occurred at 1:30 p.m. (10:30 GMT) in international waters west of the port of Hodeida in Yemen, which is under Houthi control. The coalition said a naval ship belonging to a member country rapidly intervened, without giving further details. The statement did not immediately provide details on the type of weapon used or the extent of the damage. Al-Malki said a coalition naval ship accompanied the oil tanker until it completed its navigation north. Pictures carried by state-run Saudi al-Ekhbariya TV showed a hole ripped through the side of the ship but no oil leaking out. The coalition spokesman described it as a “terrorist attack” that threatens commercial shipping routes in the vital Bab al-Mandeb strait, used for oil shipments from the Gulf to Europe, as well as goods from Asia to Europe. 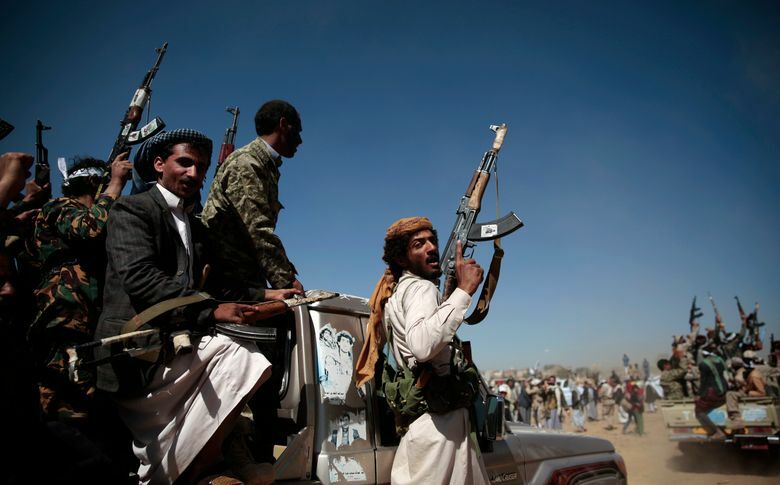 The Houthis have in the past targeted military ships belonging to coalition partners Saudi Arabia and the United Arab Emirates, but the attacks have failed to cause any substantial damage. Tuesday’s attack came one day after an airstrike by the Saudi-led coalition killed at least 14 people near Hodeida. The airstrike hit a compound housing displaced people in the town of al-Hami. Deputy Health Minister Walid al-Emmad said at least eight women and five girls were among those killed. The Saudi-led coalition has been at war with the Iran-allied Houthis for more than three years, a conflict that has killed more than 10,000 Yemenis and devastated the Arab world’s poorest country. Saudi-led airstrikes have killed thousands of civilians and destroyed hospitals, schools and markets. Al-Malki suggested Iran had a hand in Tuesday’s attack, repeating Saudi allegations that Tehran is arming the Houthis. The U.S., which is providing some support to the coalition, and its Arab allies accuse Iran of providing increasingly sophisticated weapons to the Shiite rebels, including ballistic missiles fired at the kingdom. Iran denies arming the rebels. The Houthis have fired close to 100 missiles toward Saudi Arabia since the war began. Last week, a missile attack killed an Egyptian worker and wounded two others in the Saudi capital, Riyadh. Meanwhile in Geneva, U.N. Secretary-General Antonio Guterres said a Tuesday conference had collected pledges of more than $2 billion for humanitarian assistance for Yemen. Saudi Arabia and the UAE pledged $1 billion toward the humanitarian response plan. The United States announced nearly $87 million in additional humanitarian aid, while the European Union pledged €107.5 million ($132 million) in new funding this year. Associated Press writer Brian Rohan in Cairo contributed to this report.